These two teams featured several members of the US Freedom and have played each other several times going back to 2008. Each team debuted that year and they matched up at nationals in the consolation game. Denver came out on top that day but two years is a long time in women's footy. New York had the better form during round robin play whereas Denver lost by the widest margin of the day to their pool winner Calgary/Montreal. There was no intimidation or nerves on either side of the ball with both teams contesting every ball. Knowing that it was put up or go home, each team clearly wanted a spot in their first ever Grand Final. In a back and forth game with neither team leading by more than a goal, Denver had the upper hand when the siren went off and a berth in the grand final. Atlanta/Sacramento rallied to a come from behind victory on Saturday to give retiring Atlanta and US Freedom Coach Wayne Kraska a bid at ending his women's coaching career the same way it started: by winning a national championship. 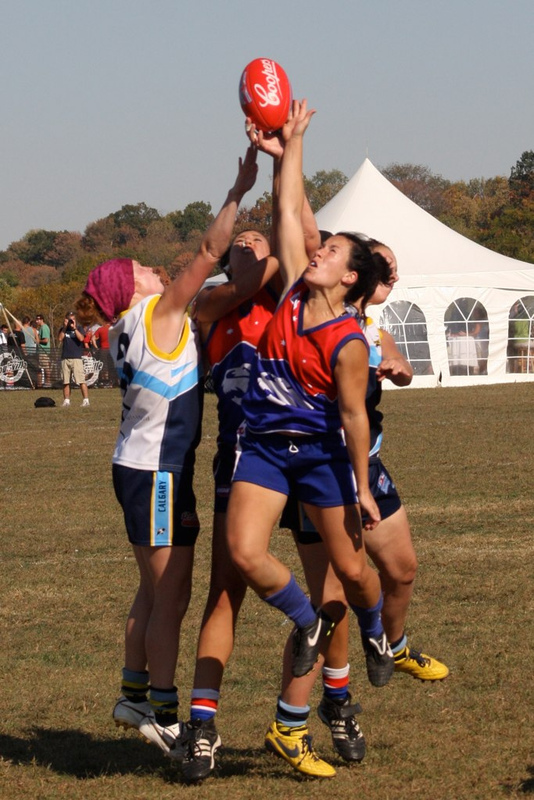 Having coached Atlanta to three consecutive USAFL National Championships and missing out on a 4th by the narrowest of margins, coach Kraska is no stranger to pressure packed games. Could his new players win one for the Krazza? Calgary came into the semi finals unscathed and it looked like the Montreal players meshed well with the girls from Alberta. There were no surprises on this day as the more experienced Canadians were too skilled and fit for the upstarts. The consolation game was a mini grand final for both clubs since neither wanted to come from Nationals without a victory. Both clubs were a mixture of experience and rookies and how those rookies would play on the second day would affect the outcome of the game. The Frozen Blue Bombers lost two players to injury and would be playing without a bench. The Hawkaroos came out running with the strong midfield play of Courtney Church, Erin Welsh, and Erin Yiakos who all have spent time with the US Freedom. The Minnesota back line led by Becky Kraft, Marie LaVictoire and Rochelle Allan made the Arizona/Columbus offense kick from angles to minimize the number of major scores allowed. The Frozen Blue Bombers were much more effective whenever they got ball into their offensive zone. Veterans Suzy Thomas and Sherelle Kelly did their usual work but Julie York from Columbus did a great job stopping balls into full forward. Accurate kicking from Sherelle Kelly, Kathryn Hogg, and Suzy Thomas were enough to put the Frozen Blue Bombers on top this day. 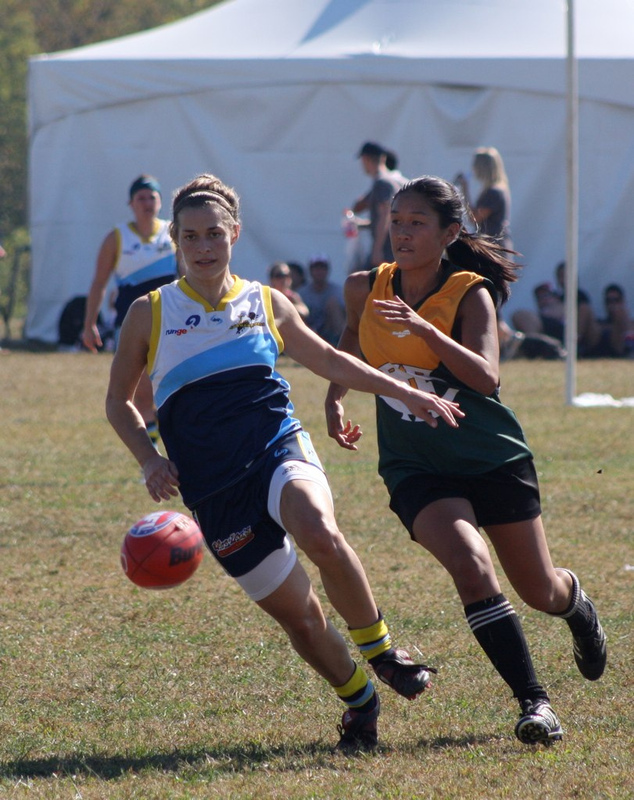 With the cross over format and Denver's breaking seed in their semi final, the championship game was a replay from the day before. On that day Calgary dominated from start to finish and were heavy favorites. Denver had never gone this deep before and Calgary was in their third Grand Final in as many years. They took home the crown in 2008 and lost to Milwaukee in 2009. They know what its like to win one and lose one and they prefer the sweet taste of victory. Denver coach Bruce Durrell obviously studied the tape from Saturday and made some adjustments to try and stymie the skillful run and carry of the talented Calgary/Montreal squad. Just like in their semi final match, they were determined to contest every ball. If they were going to lose the match, they were going to make Calgary earn it. Denver clearly wanted to stop Calgary before they could take off with the ball. Their back line stopped chance after chance and it was the Denver team that capitalized on break aways. Calgary lead early but the opportunistic Denver squad took the lead in the second half by being more accurate on the scoring chances they had. Despite being down by two goals, Calgary wasn't giving up and a goal put them within striking distance of the Bulldogs. They had chances after that but couldn't put it through the middle posts. It looked like they were going to do it one point at a time but Denver held on for the win in the tightest Grand Final ever. No third place game was played. New York/Baltimore is awarded third place by beating Atlanta/Sacramento in the round robin competition. Denver is the 4th team in as many years to win the USAFL National Championship with Atlanta (2005-2007) being the only team to have won more than one championship.